THE OTHER SIDE - words and music by Gerda Stevenson, track 10 from Gerda's album of her own songs, NIGHT TOUCHES DAY (Gean Records, 2014). Gerda sings this song accompanied here by Kyrre Slind on banjo, and Rob MacNeacail on guitar, filmed and recorded by Rod Buchanan-Dunlop, 2015. Performed at the Eastgate Theatre, Peebles, February, 2016. 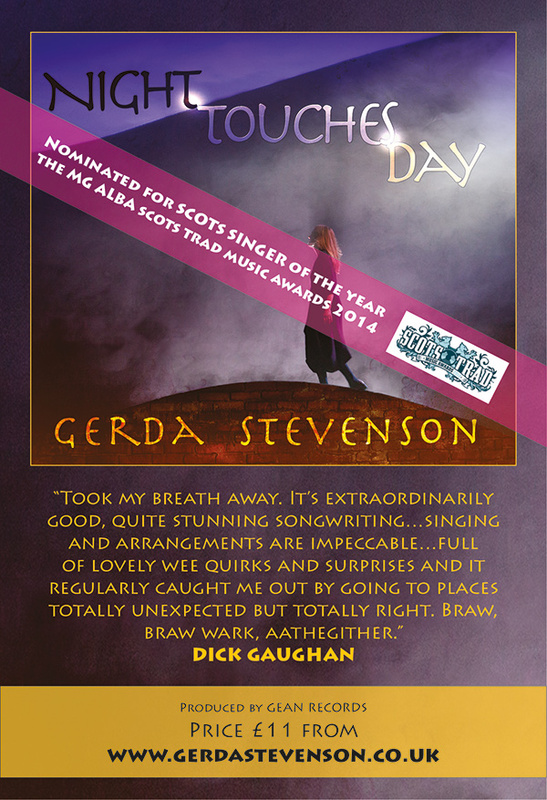 Words and music by Gerda Stevenson, track 13 from her CD Night Touches Day (Gean Records). AYE THE GEAN - words and music by Gerda Stevenson, track 13 from Gerda's album of her own songs, NIGHT TOUCHES DAY (Gean Records, 2014). Gerda sings this song accompanied here by Kyrre Slind on lute, filmed and recorded by Rod Buchanan-Dunlop, 2015.